Harriniva Hotels & Safaris in Muonio is alive with happy chatter of tourists who have gathered in Muonio from across Europe and further afield for once-in-a-lifetime experiences. 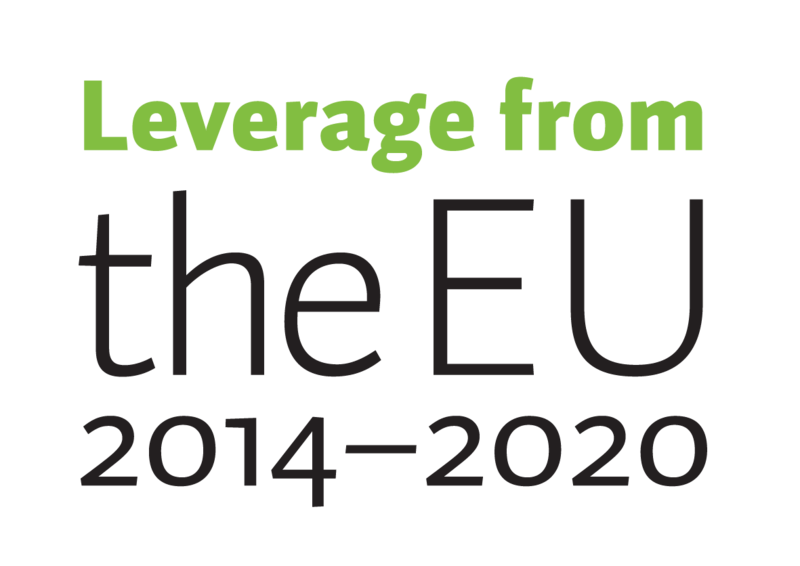 The last wilderness of Europe offers unique experiences to visitors. The 45-year-old Dutch Dirk is now spending his 16th winter in Muonio, and it is his job to make these experiences come true. 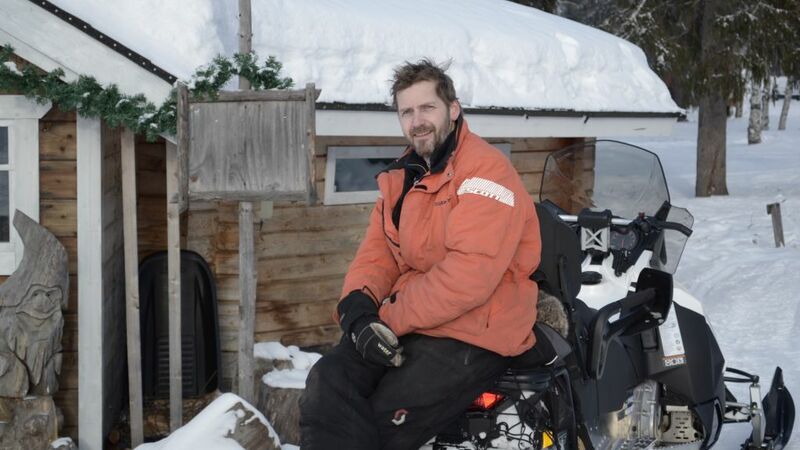 Dirk works as a wilderness guide, and one of his main tasks is to guide snowmobile safaris. – I have a very social job where I get to meet people and speak my mother tongue almost every day. 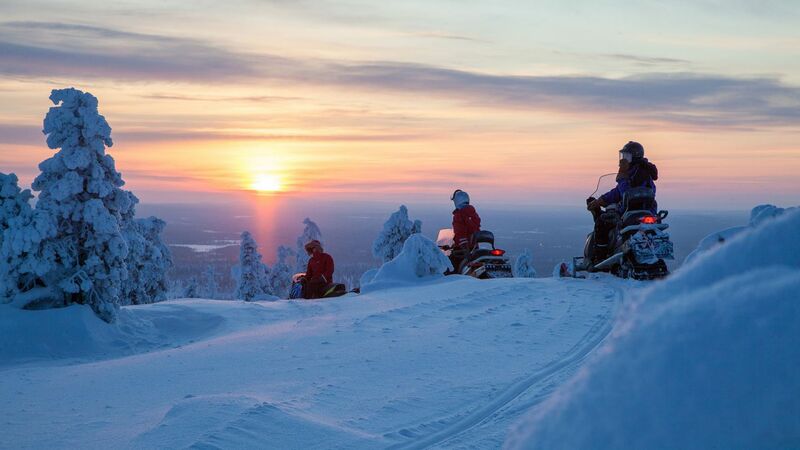 We take people out to beautiful places and tell them about Lapland. When you reach the top of the Olos fell and take a look around, all you can see is more fells and forest. The view is very impressive. The visitors are thrilled to see all this snow, the amount of which is quite incredible, says Dirk who works for Harriniva Hotels & Safaris. In addition to the snowmobile safaris, Dirk takes people out on reindeer safaris and snowshoe walking trips. Once out in nature, Dirk likes to explore the more demanding locations available in Muonio. The Äijäkoski rapids near Muonio are an excellent location for snowshoeing, for example. It was through work many years back that Dirk met his then girlfriend and the woman he is now married to. For years, the couple would return to Muonio for the winter to work as wilderness guides. After four years of travelling back and forth they decided to stay permanently in Muonio and bought a house. Ever since, they have been busy working throughout the year. Today, Dirk’s wife works as a receptionist and Dirk works as a carpenter in addition to his job as a wilderness guide. The Harriniva camping site also keeps him busy during the summer. When he is not working, Dirk spends time at home with his family. Dirk and his wife have two children aged 8 and 10. His mother and brother live in the Netherlands, and the family gets together both in Finland and in the Netherlands. The more time passes by, the less Dirk misses from his home country. He has adapted well to life in Finnish Lapland, and is happy to be far removed from the busy and stressful life of the city. You don’t experience the same kind of stress here as you do in the city. These are the things I hold in great esteem, and this is where they are easy to find, Dirk says. Dirk’s home city of Tilburg has just over 200,000 inhabitants, whereas the number of people in Muonio is 2,347. Nowadays it takes Dirk less time to commute the 30 kilometres to work in Muonio than it did the 10 kilometres in the Netherlands. In Dirk’s experience, the abundance of choices in the city does not make people happier; instead, the opposite is true. – Shops are open 24 hours a day, and at the cinema you have 25 films to choose from. People don’t seem any happier; they have too many options. I believe that people here are able to appreciate whatever good things they have. People here are absolutely wonderful, Dirk says. Dirk relates that, at present, he is living his dream; life is good in the Fell Lapland region. – When you have children, they become the most important thing in your life. I hope that everything will be fine with my children and I want to offer them a good childhood. Everybody has dreams; mine is to travel, so I’m going to Iceland for work next month. But big dreams? I am happy, I like my job, and I like my life. For me, everything is fine, Dirk says with a smile, leaning against his snowmobile.